Even the love of her boyfriend, Xavier Woods, and her siblings, Gabriel and Ivy, can't keep the angel Bethany Church from being tricked into a motorcycle ride that ends up in Hell. There, Jake Thorn bargains for Beth's release back to Earth. But what he asks of her will destroy her, and quite possibly, her loved ones, as well. Can he be trusted in this wager? 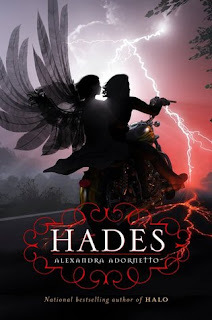 Alexandra Adornetto's Hades has it all - good and evil, angels and demons, romance and heartbreak. I've seen Juliet Immortal on several blogs! I hope you enjoy it! Seriously, though, Stacey Jay is a great author. If you haven't read her books, you should definitely think about picking one up soon. Great set! Love Lurlene McDaniel. Juliet Immortal sounds really good. You got a nice list of books this week in your mailbox. I still need to read Halo before I can read Hades.